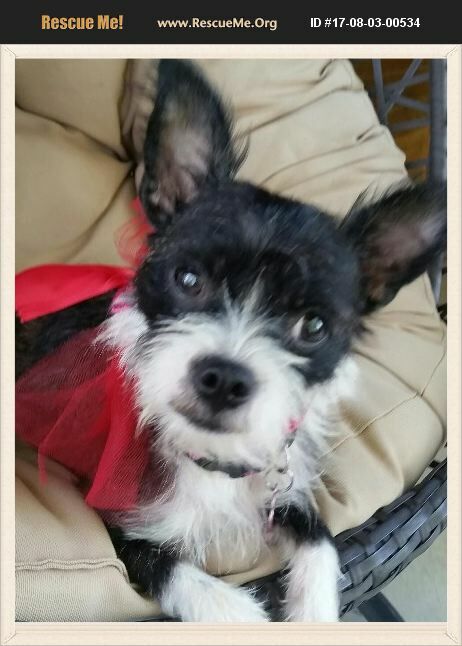 Kewpie is 1yr old female Boston terrier/Chinese crested mix. An owner surrender from too many dogs in the house. She continues to build her potty skills & walking on lead with harness. She prances with her long legs like the Chinese crested princess of her heritage. Her black & white coat is wire hair. She weighs 8.5# & is about 12' tall. She is still a tad shy but loves to cuddle. She is learning more about toys & starting to dance when she is excited. She is still checking out people & learning more about them. Spayed, heartworm negative and on prevention, current on vaccinations and microchip. Suggested adoption donation is $350-450. If Kewpie sounds like the dog of your dreams fill out an application for her at www.ruff-rescue.com today.